All our audio is still available via SoundCloud. We hope to come back with a new project soon. Source-code is available at github. Please note: DarwinTunes will be shutting down soon. Join our unique experiment, and be the first to hear music as it evolves, right between your ears! It has also given us the splendours of human culture. This may seem like a bold claim, but it is self-evidently true. People copy cultural artifacts – words, songs, images, ideas – all the time from other people. Copying is imperfect: there is "mutation". Some cultural mutants do better than others: most die but some are immensely successful; they catch on; they become hits. This process, repeated for fifty thousand years, has given us all that we make, say and do; it is the process of "cultural evolution". However, the underlying mechanisms are poorly understood. For example, how important is human creative input compared to audience selection? Is progress smooth and continuous or step-like? 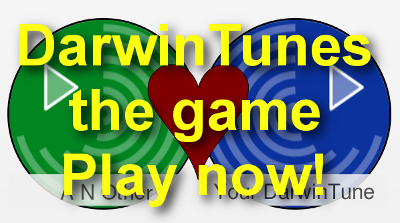 We set up DarwinTunes as a test-bed for the evolution of music, the oldest and most widespread form of culture; and, thanks to your participation, we've shown that reasonably complex and pleasing music can evolve purely under selection by listeners. These are now on their own page.